There are people all across Northwest Pennsylvania who could benefit from the Sight Center’s services but don’t know about our organization or believe they wouldn’t qualify for help. The Sight Center is here for ALL members of the community who have concerns about their failing or lost vision. The frightening truth is that vision loss is on the rise. Erie, PA., has an increasing aging population along with a high incidence of medical conditions like diabetes. Together, this combination can lead to severe and permanent vision loss. The Sight Center works with eye care professionals and other community resources to complement and enhance the supports available for those with vision loss. If you or someone you know is experiencing vision concerns, please contact the Sight Center. We’re here to help. (814) 455-0995. Our staff are available to share the work of our mission with groups and individuals across the community. Through engaging presentations that highlight services or educational programs focusing on eye health and safety, education and community outreach is a priority. It is our goal that people in the region will “know us before they need us.” If your business, group or organization would like to schedule a speaker, please contact the Sight Center’s Marketing Department at 814-455-0995. The Sight Center has launched, Women of Vision, a group of dynamic, female leaders that serve as Sight Center Ambassadors. Women of Vision share our mission with the community. Through educational opportunities to “get to know us better,” these women are equipped to take the message of hope and support to those who need it most. If you’re interested in learning more about the Sight Center’s Women of Vision group, or would like to join, click here for an application or contact Shannon Wohlford at 814-455-0995 or email shannonw@sightcenternwpa.org. Looking toward the future, the Sight Center recognizes that our organization will face many challenges and at least as many opportunities. Diversifying funding sources and strengthening programs continues to be our number one focus. 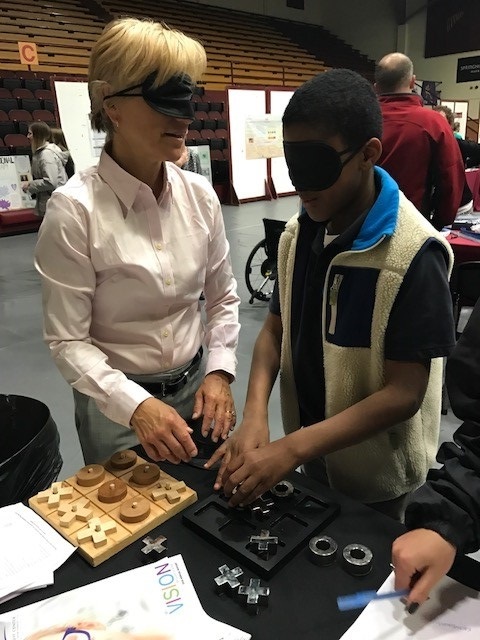 The Sight Center continues to collaborate with many key community partners to enhance existing services, grow new programs and meet the ever-changing needs of individuals with vision loss.